The constantly changing inventory in our bookstore is primarily the result of donations by generous citizens, who give us thousands of books and other items every year. All are in good condition, with many like new. We have most of the sections of a typical commercial bookstore, from novels and mysteries to cookbooks, artbooks, science, history, biography, classics, children’s, and many others. In addition, handy tote bags imprinted with the Friends logo are available for sale. The Friends Book Cellar first opened for business on March 22, 1998, in the lower level of the Central Library at 140 East Main Street in downtown Lexington, where it remains today. We are open six days a week, Monday-Saturday, from 10 a.m. to 4 p.m. The store is also open from 1-5 p.m. on the first Sunday of each month, when a 20 percent discount is offered to all customers. Proceeds from operation of the Friends Book Cellar go to support library programs. 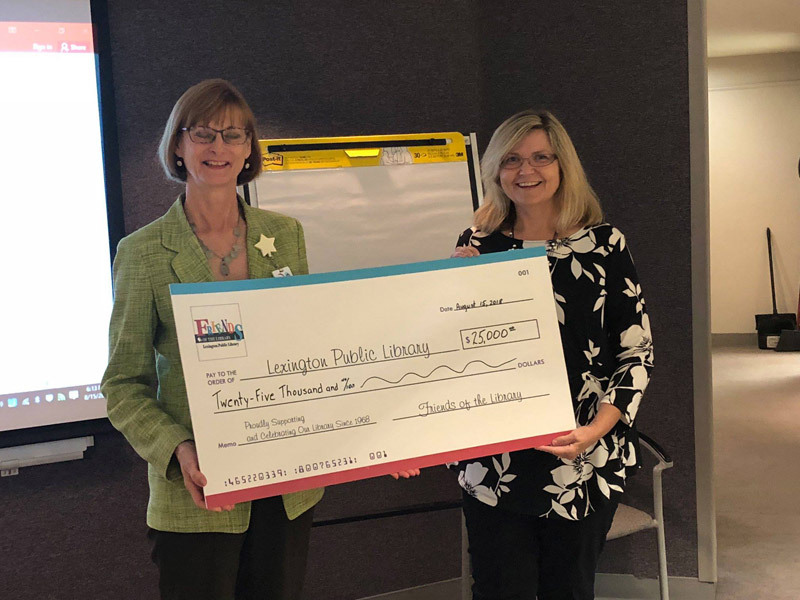 Ann Hammond, left, executive director of the Lexington Public Library, accepts a payment of $25,000 as one installment of the Friends’ fiscal 2018/19 support. Friends president Lori Meister, right, made the presentation at the Friends board meeting in August 2018. The bookstore stages semi-annual sales, in April and October, during which thousands of items from our huge surplus inventory are sold at sharply discounted prices. Additionally, an active online sales department provides a broader exposure for our more valuable items. Five levels of Friends membership -- individual, household, patron, sponsor, and lifetime -- bring with them a 10 percent discount on all purchases year around, including an additional 20 percent discount all during the member’s birth month. Although the store supports three paid part-time management positions, most of the day-to-day work of running the store falls to a dedicated group of about 50 volunteers. They sort, price, and shelve books and other items, operate the cashier stand, and provide friendly customer service. They, along with more than 500 volunteers working in other capacities, annually contribute approximately 9,500 hours of work to this charitable cause. They literally make the store possible. A Friends Board of Directors has oversight for the bookstore. Volunteers are always needed for all areas of store operations, from bookseller to sorting room assistant, pricing and shelving, online sales assistant, as well as seasonal workers for our semi-annual sales. We offer flexible schedules and a great opportunity to support your public library while serving a diverse customer base. We would welcome your participation. For information on volunteering, call 859-231-5505 or email us at friends@friendsbookcellar.org.